Celebrate elegant, French design elements in your home or backyard with the American GardenWorks Black Fleur-de-Lis Pot Trellis. The traditional arch, robust steel body, and black color create a lasting adornment, sure to bring a timeless look to your home or yard in moments. 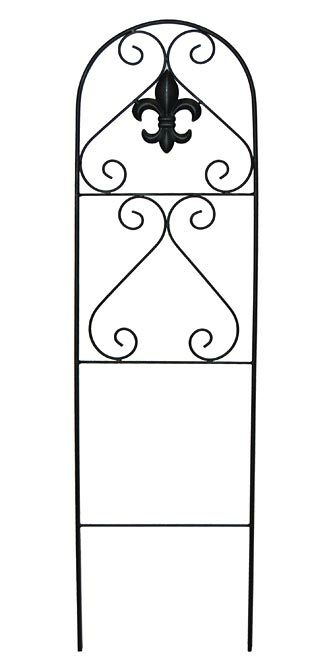 A familiar, fleur-de-lis accent rests near the top of this trellis, with dual scrolls and a soft arch above it. Horizontal rods add support to the piece, and additional scroll shapes complete the unit. The sturdy, 0.25" diameter, steel arch will certainly look great for many seasons, and its black, powder coated finish protects this item from the elements. The two, 9.5" long legs insert into soil easily, or can be placed in a 13" diameter or larger pot for indoor plant support. Turn your garden or home into an inspired retreat with this Black Fleur-de-Lis Pot Trellis. Made in the USA.